We recently heard from two of the winners of our recent Happy New Year Jackie Contest. Thank you to Annie and Dagmar for sharing your stories (and photos) with us! Thank you so very much to everyone who has included a donation for the Build a School project with Jackie's birthday card. We've seen a noticeable difference this year in terms of the number of gifts that Jackie has received (there are many less gifts and much more money). It looks like the fans really are supporting Jackie's wish to have donations for the charity instead of gifts. Thanks! The contest is almost over, so if you haven't sent your card in, hurry! If you want to send a card with a donation but you think it's too late, you can send it through email and then just make a donation to the Dragon's Heart Foundation at the charity donation page on our main site. As long as your entry is in by Jackie's birthday on April 7th, you will be considered for the contest. Remember, all money sent for Jackie's birthday will be added together and announced when the contest ends. Then we will add this to the total. 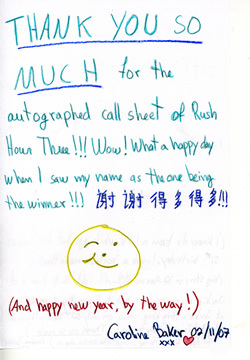 Here's One of Our Lucky "Guess Jackie's Riddle" Winners! 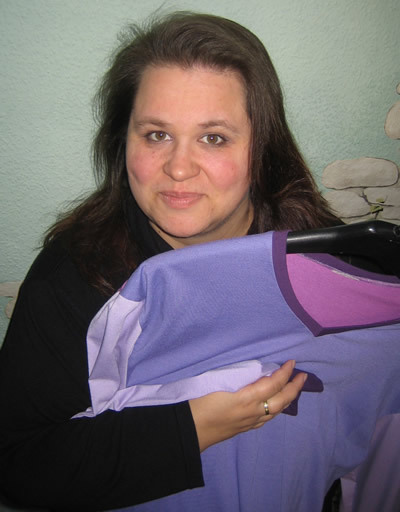 Here's Kirstin from Germany with the shirt Jackie wore in Rob-B-Hood. 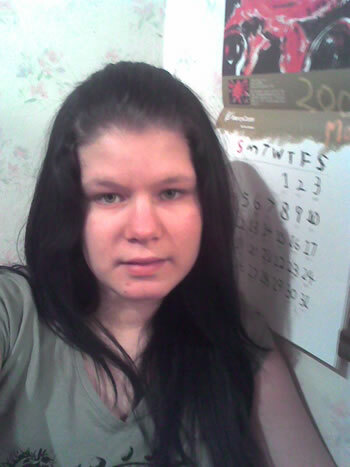 Thanks for sending us a photo, Kirstin - and congratulations!! I was really happy when I got the mail at my grandmom's house. I saw something brown at her table, and I hope that it was for me! 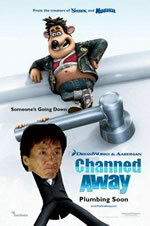 When I stepped into her kitchen, she was smiling, and she said, "You have a letter and it's from Jackie Chan." I opened it and it was a really nice calendar. My day was really good, I was happy all day long! And now I hang it up in my room, and I think it looks great! So I want to say Thank you so much to Jackie for being so kind! I Love You! Hugs From Rebecca In Sweden! Have you taken a look at the "Movies That Weren't" pages at the Kids Corner? There's a new movie there from Jeremy, plus there are a lot of really funny older ones posted. Why not take a look? Just click on Jeremy's movie poster to see all of them! Build a School Total Hits $17,000! Look at how much money you've raised for the Build a School project! Thanks to people from all over the world, the total is growing slowly but steadily. You can read about some very special helpers in our Build a School Helpers section here. there. 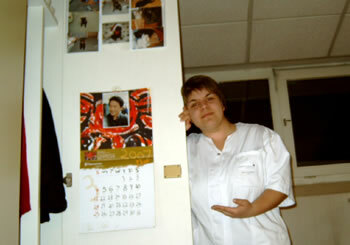 An amazing gift, the most beautifull thing a Jackie Chan fan can get. Thank you for the calender, it is by far the best gift I ever got. I want to say a BIG THANK YOU for sending the calendar to me and I want to say a BIG THANK YOU also to Jackie Chan for giving such a great prize! I added a photo where I put the calendar. I put it on the door of my cupboard in my workplace. Now- every day when I go to work and open the door, I get so much extra power while looking at this wonderful artwork and present. Thank you to Marjorie, who has been very busy these past few weeks making new Buddy Bear designs. Click below to see all the new ones! 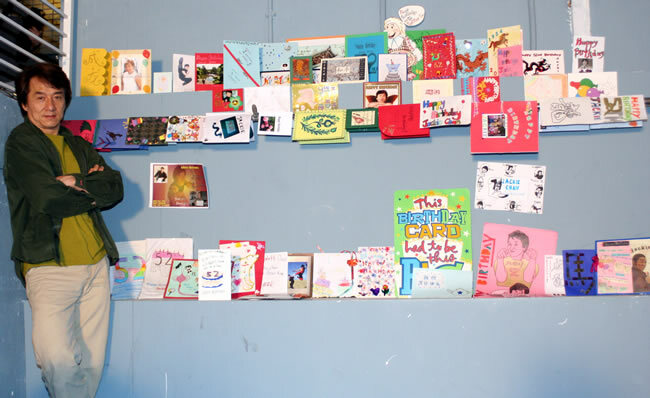 Jackie is going to be so pleased and proud of all his fans who have sent him such beautiful birthday cards! 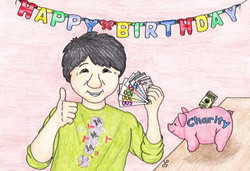 Many of you have sent in donations along with the birthday wishes - thank you for doing that! Every single dollar is appreciated. 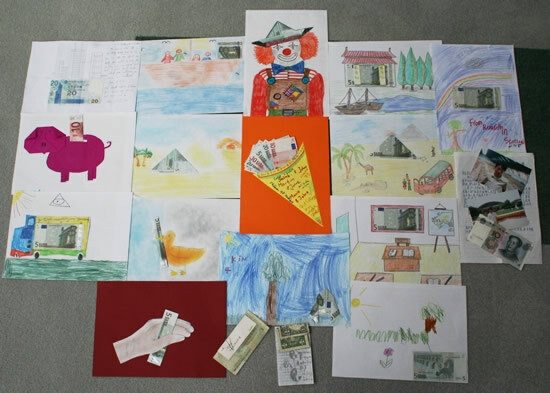 Some of you have included notes describing how you raised the money that you sent. All of these stories will be shared with Jackie. Click here to see the newest cards. Even though our Kids Corner cartoonist Petra works both inside and outside her home (she takes care of her family AND holds down a job), she's never too tired to remember all of us here at the Kids Corner. 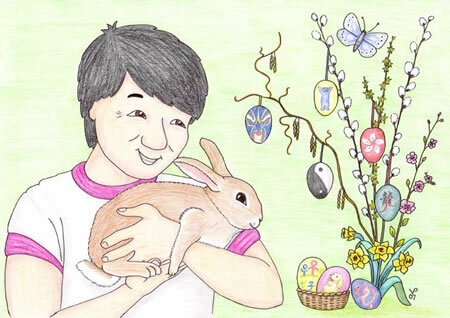 She has come up with an adorable coloring page for those of you who celebrate Easter. And for those of you who don't, it's an adorable coloring page of Jackie standing next to a very unusual plant while holding a rabbit! 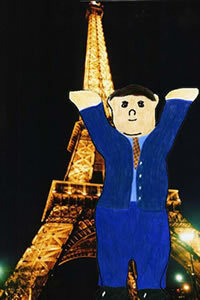 Click on Jackie to visit our Coloring Pages where you can print and color in your own pictures! 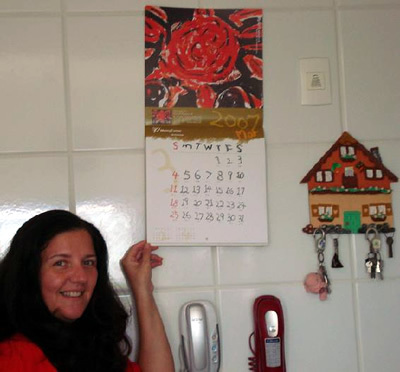 Even though Claudia from Brazil didn't receive one of the autographed calendars, she was kind enough to send us a photo of herself with the calendar she did receive. Thanks Claudia! It's always nice to hear from the fans. Jackie, thank you very much!!! I love my new calendar!!! My kitchen is beautiful now!!! Kids Corner cartoonist Petra Vogel has come up with a terrific new project for you to make - a Jumping Jackie! For information, click here. We also heard from Elizabeth, a lucky fan who met Jackie and got his autograph at a Rob-B-Hood promotion in Malaysia. Thanks to fans who have begun to mail their birthday cards in to our office. We've received several in the last few days and we hope to receive many more! For information, click here. To see the cards that we've received already, click here. Look what we found a photo of! 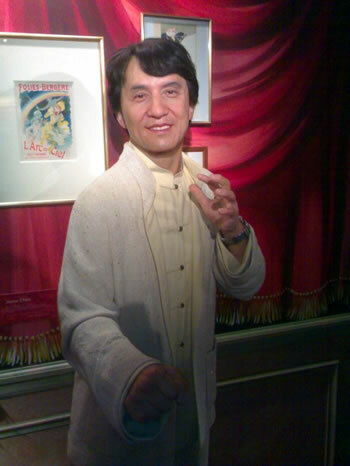 It's Jackie's wax figure at the Musee Grevin in Paris. Jackie was unable to attend the unveiling while he was in Paris last fall and we didn't even know the statue was being displayed! So what do you think? Does it look like Jackie? More birthday cards have arrived! Remember, Jackie's birthday is only a month away, so hurry and send yours in! 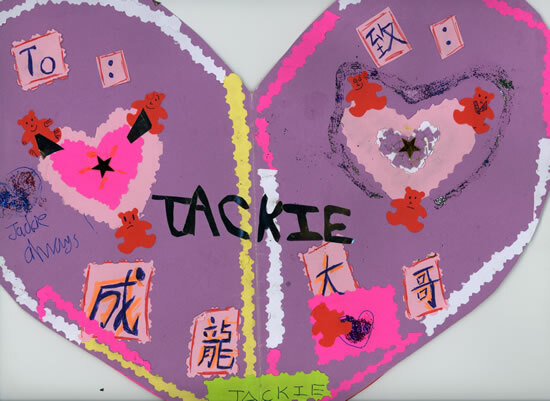 We have some great prizes for the contest, but more importantly, we all want to surprise Jackie with many beautiful cards like we did last year. He was so happy! Click here to find out how to send Jackie a birthday card. Here's Jackie with some of the cards from last year. Click here to see this year's cards. Wow! Marjorie has been very busy. 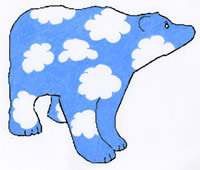 Check out some of the great Buddy Bear designs she's sent in. There's also a great Irish bear from Laura. Thanks everyone! Click Inspector Buddy Bear Lee to see the new designs. 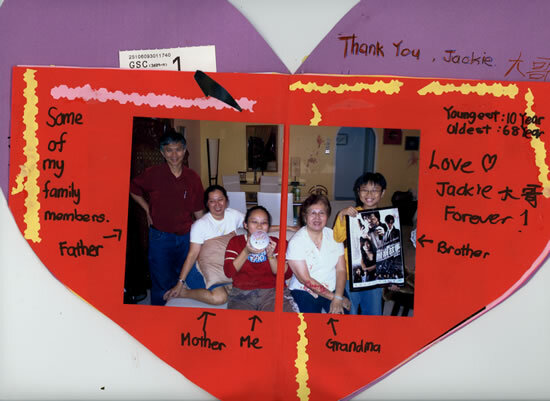 Fans have begun sending in their birthday cards for Jackie. Are you wondering how they could mail them to Hong Kong so quickly? Well, what they did was to scan their cards and send them to us, then they put the cards in the mail. By doing that, they can see their beautiful cards displayed on our website (and Jackie can too). Why not make a festive card for Jackie, scan it, then mail it in? Remember how happy Jackie was to see your New Year greetings!